Dupli-Colors Paint Shop finish systems give you everything you need to create a high-quality DIY finish--primer, color, and clear coating. Paint Shop systems are easy to apply; they dry quickly, and can be buffed to a brilliant, smooth finish. The Paint Shop systems are ready-to-spray, so no mixing or reducing is required, and with no re-coat window, additional coats can be applied at anytime. (ANNOUNCER)>> TODAY ON MUSCLE CAR, THIS MAY BE YOUR FATHER'S OLDSMOBILE, BUT RICK AND TOMMY ARE GONNA TURN IT INTO YOUR FATHER'S PILE OF CAR PARTS. 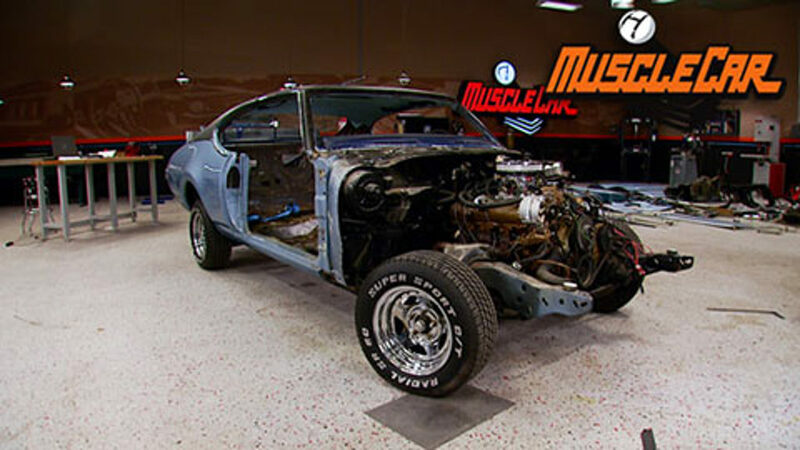 PLUS MIXING PAINT AND A CAR SHOW FOR SOME DESERVING KIDS, MUSCLE CAR STARTS RIGHT NOW! 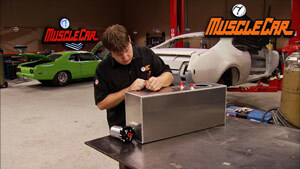 (TOMMY)>> HEY Y'ALL, WELCOME TO MUSCLE CAR. WE'VE POLISHED OFF OUR MUSTANG PROJECT AND SHE'S HAD A PRETTY GOOD RUN. LATER DOWN THE ROAD WE'RE GONNA THROW A FEW MORE PARTS AT IT AND SEE WHAT IT CAN REALLY DO. BUT FOR NOW WE'RE LOOKING FOR SOMETHING A LITTLE DIFFERENT TO WORK ON. 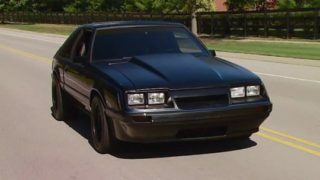 (RICK)>> AND SINCE LIMELIGHT HERE WAS BUILT BASICALLY AS A STOCK TYPE RESTORATION, WELL WE DON'T WANT TO JUST START THROWING PARTS AT IT CAUSE THEN IT WOULDN'T BE STOCK FOR VERY LONG NOW WOULD IT? (TOMMY)>> SO WE NEED OURSELVES A PROJECT, AND I JUST SO HAPPENED TO HAVE AN IDEA. YOU GUYS REMEMBER THE HURST OLDS FROM BACK IN THE DAY? 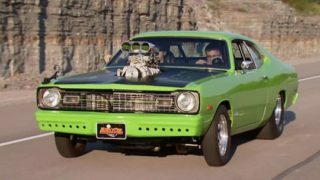 THESE BAD BOYS WERE SOME OF THE MOST ICONIC MUSCLE CARS OF THEIR ERA. NOT ONLY DID THEY PERFORM REALLY WELL, BUT THEY LOOKED DANG GOOD DOING IT. MY FAVORITE OF THE BUNCH WOULD HAVE TO BE THE 1969 HURST OLDS BECAUSE NOT ONLY DID IT HAVE A FIRE BREATHING BIG BLOCK THAT WAS ALL BUSINESS, BUT THEY WERE ALSO JUST PLAIN MEAN LOOKING. BUT TECHNOLOGY'S CAME A LONG WAY SINCE 1969, AND THERE'S A WHOLE WORLD OF IMPROVEMENTS THAT CAN BE DONE AND STILL RETAIN THAT OLD SCHOOL FLAVOR. SUSPENSION, INTERIOR, AND POWER PLANT ARE JUST A FEW. 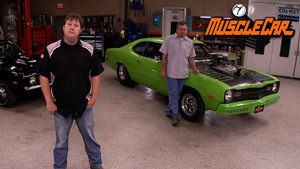 (RICK)>> SO WE WANTED TO BUILD SOMETHING KINDA ALONG THE LINES OF A '69 HURST OLDS. NOW IT'S A GOOD IDEA BUT KINDA HARD TO PULL OFF IF YOU DON'T HAVE A CAR. WELL AS LUCK WOULD HAVE IT WE GOT ONE. (TOMMY)>> HEY MISTER WILLIAM, HOW'S IT GOING? (WILLIAM)>> FINE, HOW ARE YOU? (TOMMY)>> I'M TOMMY, THE GUY WHO TALKED TO YOU ON THE PHONE. THIS IS MY PARTNER IN CRIME, RICK. (RICK)>> WE TOOK A SPIN UP THE ROAD TO LOUISVILLE, KENTUCKY, WHERE WE FOUND A GUY THAT'S GOT EXACTLY WHAT WE NEED, A 1969 OLDS CUTLASS. 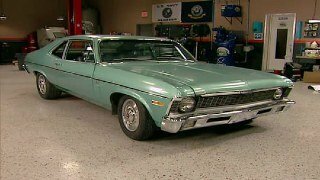 (WILLIAM)>> THE GUY THAT I PURCHASED IT FROM WAS THE SECOND OWNER, AND IT WAS IN HIS FAMILY QUITE A WHILE AND IT WAS STORED AWAY IN A BARN. (TOMMY)>> IT LOOKS LIKE IT'S GOT AN OLD PAINT JOB. THE PAINT'S ALL BROKE UP, AND THERE'S DEFINITELY BEEN A PATCH PUT IN DOWN THERE ON THE BOTTOM. (RICK)>> YEAH, I NOTICED AT A GLANCE THIS UP HERE. IT'LL TELL US THE TALE. FEW MINOR TROUBLE SPOTS. AND THIS OLD CAR HADN'T BEEN HOT RODDED AROUND MUCH. IT STILL HAS OVERSPRAY FROM THE LAST PAINT JOB. (RICK)>> I DON'T SEE A WHOLE LOT OF RUST. IT SURE SHUTS SOLID. A LITTLE BIT OF RUST THERE, BUT THAT'S NO BIG DEAL. OOH, WE'VE GOT SOME AFTERMARKET GOODIES GOING ON HERE DON'T WE? (TOMMY)>> YEAH, WE'VE GOT AN INTAKE AND CARB. MAN THIS THING DEFINITELY LOOKS LIKE IT WAS A DRIVER. (RICK)>> IT RUNS FAIRLY SMOOTH. IT'S IGNITION, CARBURETOR, ALL THAT STUFF SEEMS TO BE WORKING GOOD. THE FRONT END FEELS A LITTLE LOOSE BUT NOT TOO BAD. SEE STUFF LIKE THAT, FOR STOCK REPLACEMENT PARTS, IT'S NOT THAT EXPENSIVE. SO IF YOU'RE GONNA BUY THIS AND USE IT FOR A DAILY DRIVER, IT PROBABLY WOULDN'T BE BAD. (TOMMY)>> YEAH WE'VE GOT SOME PRETTY BIG PLANS FOR IT. (RICK)>> HEY MADE IT BACK MAN. WELL SHE AIN'T PERFECT BUT SHE AIN'T $20,000 EITHER. I'D SAY IT'S EXACTLY WHAT WE NEED. (TOMMY)>> GOOD DEAL, WELL LETS ME AND YOU GO TALK SOME PAPER WORK IF YOU DON'T MIND GETTING IT LOADED. GOOD DEAL! YOU GOT ANY SWEET TEA? SO WE'VE HAD THIS THING HANGING AROUND IN THE WAREHOUSE FOR A LITTLE WHILE NOW, AND TODAY WE FINALLY GET TO TEAR INTO IT. THIS AIN'T GONNA BE NO SCUFF JOB AND MOTOR SWAP. WE'RE GOING ALL OUT ON THIS ONE. (RICK)>> NOW FIRST THE BODY COMES OFF AND GETS BLASTED TO GIVE US A SOLID FOUNDATION, FOLLOWED BY LOADS OF BODY MODS THAT TRANSFORM THIS THING INTO A SERIOUS LOOKING MACHINE. THEN WE'RE GONNA GO AFTER THE DRIVE TRAIN, INTERIOR, HECK, YOU NAME IT. (TOMMY)>> THEN WE'RE GONNA GIVE IT A CUSTOM PAINT SCHEME AND MAKE IT OUR OWN WITH A ONE OF A KIND APPEARANCE. SO STICK AROUND, THIS IS GONNA BE ONE OF OUR BIGGEST BUILDS EVER. (ANNOUNCER)>> STILL AHEAD, THE GUYS CAN'T GET THEIR ACT TOGETHER WHILE THEY TEAR APART OUR NEW OLDS. AND WE TAKE A TRIP TO YEAR ONE'S ANNUAL BRASELTON BASH. (TOMMY)>> HEY Y'ALL, WELCOME BACK. 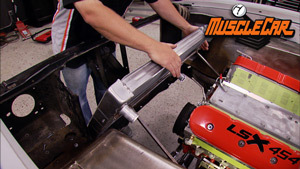 IT'S TIME FOR US TO GET ELBOW DEEP INTO OUR LATEST PROJECT, THE '69 OLDS CUTLASS. 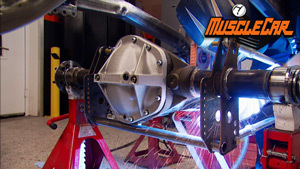 WE'RE BUILDING A HURST EDITION TRIBUTE CAR AND EVERY NOOK AND CRANNY OF THIS THING HAS TO BE REDONE. (RICK)>> THAT MEANS THAT EVERY NUT AND BOLT ON THIS OLD GIRL IS COMING OFF, AND EVERY PART IS GONNA BE REBUILT, REFRESHED, OR REJECTED. I LIKE HOW THE AIR CLEANER TIE DOWN IS ALMOST AS BIG AS THE AIR CLEANER. PROBABLY END UP REUSING THE HOOD HINGES. OHH, IT'S PEEING! (TOMMY)>> WHEN WE GOT THE CAR, WE STARTED WALKING AROUND IT TO SEE WHAT WE WOULD KEEP AND WHAT WE WOULD CHANGE. BUT WITH THE HOOD ON IT, WE SAID WE'RE DEFINITELY GONNA HAVE TO TUCK THE BUMPER IN CAUSE THIS CAR'S KINDA GOT AN UNDER BITE. AFTER TAKING THE HOOD OFF, THIS THING'S GOT A HUGE UNDER BITE. ALMOST AFRAID TO BE THIS CLOSE TO THE FRONT END OF IT. SOME OF THAT CAJUN SHRIMP. HAVE YOU NOTICED THAT A LOT OF THE SHEET METAL ON THIS THING IS UNDER TENSION? BUMPER BRACKET SPRUNG OUT, UNBOLT THE FENDER, THE FENDER RELEASES. IT'S LIKE EVERYTHING ON THIS THING'S UNDER TENSION. SOMEBODY WAS PRYING ON IT. OKAY GO, TIGHTEN IT DOWN, WHEW, STAY! (TOMMY)>> HEY, YOU CUT THE PART I WAS SUPPOSED TO GET. THEY CUT THE BRACE OUT OF IT. (RICK)>> YEAH, THEY CUT THE WHOLE BRACE OUT. OF HAVING IT SIT UP ON A RACK WHERE YOU'RE HAVING TO FIGHT IT, MOVING AROUND. THAT AND YOU'RE ALWAYS RUNNING THE RISK OF DENTING THE THING IF IT'S SITTING ON A RACK. SO PERSONALLY I THINK IT'S A LOT BETTER TO DO IT LIKE THIS. (TOMMY)>> THAT WAS THE FUNNIEST EVER! (RICK)>> I NEED A HAMMER. HA, HA, SUCCESS, STUPID WINDOWS. BE WORTH A FEW EXTRA BUCKS. (RICK)>> NOW YOU'RE GONNA BE TAKING THESE THINGS APART, ESPECIALLY IF THE CLIPS ARE STILL GOOD. A LOT OF THESE SCREWS, IT'S NOT GONNA BE A REAL EASY PIECE TO FIND. SO I USUALLY TRY TO KEEP THEM AND TAPE THEM TO THE PART. BUT TOMMY AND I HAVE A FEW IDEAS ON HOW TO KINDA MODERNIZE IT, SPRUCE UP THE INTERIOR. NOW THE FRONT SEAT, WELL I DO LIVE IN THE SOUTH NOW AND I'VE GOT A PRETTY BIG FRONT PORCH, AND PATIO FURNITURE'S EXPENSIVE. ( )>> YEE HAA! THANKS FOR THE HELP TOMMY. A LOT MORE ROOM WHEN IT'S OFF THE CAR. NOW SHE'S STILL GOT A PRETTY GOOD WAYS TO GO, BUT FOR NOW SHE'S ALL POTENTIAL. 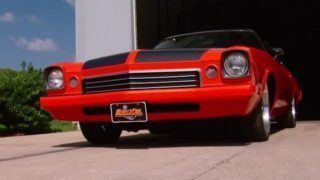 (ANNOUNCER)>> STICK AROUND, CHIP FOOSE, KENNY WAYNE SHEPPARD, AND A WHOLE HERD OF HOT ROD LOVERS COME TOGETHER TO HELP OUT SOME DESERVING KIDS. PLUS A PAINT MIXING DEMONSTRATION! (KEVIN)>> THANK YOU SO MUCH FOR BEING HERE. (TOMMY)>> EVERY SEPTEMBER A GROUP OF HOT ROD ENTHUSIASTS GET TOGETHER IN BRASELTON, GEORGIA. THEY'RE HERE TO HAVE A GOOD TIME, PLAY SOME POKER. ( )>> RICHARD YOU WON BY ACCLIMATION. (TOMMY)>> AND LEND A HAND TOWARD A GREAT CAUSE. (CHIP)>> IT ALL GOES TO PROGERIA RESEARCH FOUNDATION. MONEY FOR THE KIDS, SO WE'RE DOING THESE CLINICAL TRIALS. WE HAVEN'T FOUND A CURE YET BUT HOPEFULLY WE'RE ON OUR WAY AND WE'VE DONE THIS. THIS IS THE SIXTH YEAR, IT'S A PHENOMENAL EVENT. (TOMMY)>> PROGERIA IS A FATAL GENETIC CONDITION THAT CAUSES CHILDREN TO AGE AT AN ACCELERATED RATE. THE CONSEQUENCES, BESIDES HAVING THEIR CHILDHOOD STOLEN FROM THEM, ARE ONGOING HEALTH ISSUES WITH HEART DISEASE USUALLY CLAIMING THEIR LIVES AT AN AVERAGE AGE OF 13. BUT THERE IS HOPE! ONLY WAY THAT PROGRESS CAN HAPPEN IS FROM EVENTS LIKE YEAR ONE. (TOM)>> THESE GUYS HAVE DONE GREAT WORKS AND REALLY DONE A LOT OF FUNDING TO ALLOW ADVANCEMENTS IN PROGERIA RESEARCH FOUNDATION. (KEVIN)>> IT'S THE WAY THESE GUYS ROLL. IF SOMEBODY NEEDS MONEY OR THEY'RE DOWN ON THEIR LUCK, THEY ALWAYS STEP IN AND PICK THEM UP, AND THEY'RE JUST ALL PROUD TO BE PART OF THIS AND SO ARE WE. (TOMMY)>> SO A CHARITY POKER TOURNAMENT. ( )>> $10,000! ( )>> THERE WE GO, SOLD! (TOMMY)>> WELL I HAD TO GET OUT OF THERE BEFORE I LOST MY SHIRT, BUT I'M NOT READY TO LEAVE YET. YEAR ONE'S ALSO PUTTING ON THIS CHARITY CAR SHOW AND WE HAD TO CHECK IT OUT. (STEVE)>> I BOUGHT ME THAT BACK IN JANUARY AND I SAID, HEY, I'M AROUND THE CORNER. SO I'M GONNA COME UP HERE AND CHECK OUT ALL THE NICE CARS. 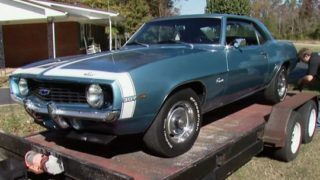 ( )>> THIS IS MY THIRD CHEVELLE, BUT ONLY THE FIRST MUSCLE CHEVELLE. WE'VE DONE ALL THIS IN FIVE AND A HALF YEARS. (CHUCK)>> WELL MY CAR'S A '52 HENRYJ. ME, MY SON, AND BROTHER BUILT IT IN MEMORY OF MY DAD. HE USED TO HAVE ONE OF THESE CARS IN CALIFORNIA, AND WE'RE GONNA REDO THIS PHOTOGRAPH. I'M GONNA TAKE MY CAR TO CENTRAL CITY PARK LIKE THIS ONE IS, PUT IT IN THE SAME POSITION, STAND BESIDE IT AND TAKE MY PICTURE, AND HAVE IT PUT BESIDE THIS PICTURE. IT'LL BE 50 YEARS THAT SPAN BETWEEN THE TWO CARS. ( )>> NICE TO FINALLY MEET YOU! (CHIP)>> NICE TO MEET YOU, WHAT'S YOUR NAME? (TOMMY)>> CHIP ALSO CAMPED OUT HERE TODAY RAISING MONEY FOR THE KIDS, ONE AUTOGRAPH AND DRAWING AT A TIME. ( )>> THE CAR POPPED OFF THE SHIRT. YOU SAW A COUPLE OF LINES A SECOND AGO AND NOW ALL OF A SUDDEN THERE'S DIMENSION AND ALMOST MOTION GOING ACROSS THIS SHIRT IT LOOKS LIKE. HOW HARD IS IT TO FRAME A TSHIRT? (KEVIN)>> WHAT DO YOU THINK ABOUT LAST NIGHT? I THINK WE HIT LIKE $80,000. WE'LL BE OVER $100,000 TODAY EASY, WHAT DO YOU THINK? (TOMMY)>> WELL WE'RE HERE. THESE GUYS HAVE A LOT OF THE PARTS WE'RE GONNA NEED FOR OUR OLDS. SO I FIGURED, WHILE WE'RE DOWN HERE, MIGHT AS WELL PICK UP A FEW PARTS. THIS IS KEITH AND HE KNOWS THIS PLACE INSIDE AND OUT. YEAR ONE OFFERS ENOUGH PART NUMBERS TO SERVICE OVER A MILLION AND A HALF APPLICATIONS. WHAT'S UP MAN? (KEITH)>> HEY MAN, HOW ARE YOU? (TOMMY)>> GREAT, YOU GOT ME A QUARTER PANEL? 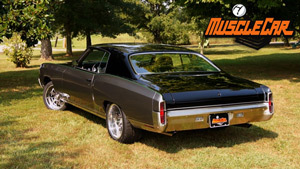 (KEITH)>> I DO, GOT A QUARTER PANEL SKIN HERE FOR THE LITTLE OLDSMOBILE. (TOMMY)>> SWEET, DO YOU GOT BOTH SIDES? (KEITH)>> I'VE GOT BOTH SIDES, LEFT AND RIGHT. (TOMMY)>> I'LL TAKE THAT AND A FEW MORE PIECES IF YOU GOT IT? (KEITH)>> OKAY, NOW YOU KNOW IF IT'S A HURST OLDS, IT'S GOT TO HAVE A WING ON IT. (TOMMY)>> MAN I CAN'T ARGUE WITH THAT AT ALL. (KEITH)>> LETS PUT THIS DOWN HERE. (TOMMY)>> WELL THAT'S PLENTY OF PARTS FOR US TO GET STARTED ON OUR OLDS, BUT I'M SURE WE'RE GONNA HAVE ANOTHER ORDER HEADING YOUR WAY. (KEITH)>> THAT'S NO PROBLEM MAN, JUST GIVE ME A CALL AND LET ME KNOW WHAT YOU NEED. (ANNOUNCER)>> COMING UP, LAY DOWN SOME LOVE ON YOUR RIDE WITH CUSTOM COLORS THAT YOU CAN CREATE. (RICK)>> PEOPLE ASK ME ALL THE TIME WHY I ENJOY CUSTOM PAINT SO MUCH, AND IN A PHRASE, FREEDOM OF EXPRESSION. I MEAN UNLIKE SO MANY OTHER ASPECTS OF CAR BUILDING, WITH PAINT IT CAN BE WHATEVER YOU WANT IT TO BE. (TOMMY)>> AND ONE THING'S FOR SURE, PAINT SETS THE TONE OF THE CAR. TAKE OLD DARK HORSE HERE FOR EXAMPLE. THE COLORS WE USED, OR ACTUALLY THE LACK OF, COMPLETELY DETERMINE THE LOOK OF THE ENTIRE PROJECT. NOW IF YOU'RE BUILDING A CAR CALLED PINK UNICORN SLIPPER SURPRISE, THIS MIGHT BE A LITTLE MORE UP YOUR ALLEY. OR HOW ABOUT THE CAN'T WE ALL GET ALONG STANG? (RICK)>> WELL I'M SURE YOU GUYS GET THE IDEA. IF YOU CHOOSE THE WRONG PAINT JOB FOR A CAR, YOU CAN PRETTY MUCH SAY BYE BYE TO A COOL LOOKING RIDE. NOW THE FIRST THING YOU NEED TO DO IS CHOOSE A COLOR. NOW YOU CAN DO THAT BY LOOKING IN THE CHIP BOOK AND CHOOSING A COLOR AND A CODE, BUT PERSONALLY I LIKE MIXING MY OWN CUSTOM COLORS. A LITTLE WORD OF CAUTION THERE, JUST BECAUSE IT'S CUSTOM DOES NOT MEAN THAT IT'S COOL. COOL BURGUNDY OR RICH COLORED EMERALD GREEN. NOT SO MUCH. YOU JUST WOUND UP WITH A GNARLY LOOKING BROWN COLOR AND LETS FACE IT, MOST PEOPLE WOULDN'T BASE THEIR CAR IN A COLOR LIKE THIS. IF THIS IS THE COLOR YOU'RE GOING AFTER, WELL CONGRATULATIONS, BUT FOR THE OTHER PEOPLE THIS COULD BE AN UNEXPECTED RESULT. (RICK)>> NOW PAINT CAN GET PRETTY PRICEY, RUNNING UPWARDS OF ABOUT $150 BUCKS A QUART. AND EVEN EXPERIENCED PAINTERS CAN HAVE A HARD TIME GETTING THE EXACT SHADE THAT THEY'RE AFTER. SO THAT'S WHY YOU NEED TO REALLY FAMILIARIZE YOURSELF WITH THE BRAND, THE TONERS, AND HOW EVERYTHING INTERACTS. WORLD WITHOUT HAVING TO SECOND MORTGAGE YOUR HOUSE IS WITH DUPLICOLOR'S PAINT SHOP FINISHING SYSTEM. THIS STUFF COMES READY TO SPRAY STRAIGHT OUT OF THE CAN WHERE YOU CAN MIX IT A NUMBER OF WAYS TO MAKE IT PERFECT FOR WHATEVER YOU'RE DOING. (RICK)>> NOW THE SYSTEM ISN'T JUST BASE COATS EITHER. THEY ALSO HAVE THE PRIMERS, THE CANDIES, THE CLEARS, PRETTY MUCH WHATEVER YOU'RE GONNA NEED. LETS CRACK OPEN SOME CANS AND GET CREATIVE. MY SILVER'S GONNA GO DOWN FIRST. I'M GONNA LAY DOWN SOME GRAPHICS A LOT LIKE YOU'D SEE SAY ON A DRAG CAR, SOMETHING LIKE THAT. NOW I'VE GOT SOME IDEAS FOR A FEW REALLY BOLD GRAPHICS THAT I WANT TO LAY ACROSS THE TOP IN SILVER. WITH THE PATTERN MASKED OFF, I'LL GO AHEAD AND HIT IT WITH SOME UNMIXED YELLOW. I'VE MIXED SOME ORANGE AND RED TO GIVE ME A SHADE THAT'S KINDA SOMEWHERE IN BETWEEN THE TWO. I'LL USE IT AS AN ACCENT COLOR TO BREAK UP THE OTHER ONES. AND NOW I'M GONNA TAPE OFF A TRIBAL PATTERN TO ADD ANOTHER ELEMENT TO THE PANEL. NOW THIS IS MOSTLY JUST FOR A, HEY, THAT'S KINDA COOL, EFFECT. THE NEXT COLOR WE'RE GONNA MIX UP IS GONNA BE KINDA A MEDIUM CHARCOAL GREY. I WANT IT DARKER THAN THE ORIGINAL SILVER THAT WE LAID DOWN, BUT LIGHT ENOUGH THAT IT'S NOT GONNA LOOK BLACK. SO I'M GONNA START OUT WITH THE SAME SILVER THAT WE USED AS OUR BACKGROUND COLOR, AND THEN TINT IT WITH SOME BLACK. NOW WE'RE GETTING SOMEWHERE. LETS SEE HOW MUCH DARKER IT'S GOTTEN. I MIXED THESE COLORS TOGETHER TO GET A SHADE THAT'S REALLY CLOSE TO THE COLOR THAT YOU SEE MOST COMMONLY IN TRIBAL DESIGNS ON HUMAN SKIN. AND ONE LAST THING, I'LL POP SOME STRAIGHT BLACK INTO MY AIR BRUSH WITH JUST A LITTLE BIT OF REDUCER AND LAY DOWN SOME DROP SHADOWS. ADD A LITTLE DEPTH TO IT. NOW YOU'VE GOT TO IMAGINE THIS ON A RACE CAR WITH THE MAJORITY OF THE CAR BEING SILVER. THIS BEING THE INSET COLORS IN THERE AND THE GRAPHICS ON THE SIDE, SPONSOR STICKERS AND STUFF ON THE FENDERS. MAN THIS WILL LOOK FANTASTIC GOING DOWN THE TRACK. THE LAST THING WE NEED TO DO IS PUT A COAT OF CLEAR ON IT. BUT FOR THIS WEEK WE'RE ALL OUT OF TIME. SO UNTIL NEXT TIME, WE'RE OUTTA HERE.